Have you ever watched Sesame Street and seen the puppets? Which is your favorite? People all over the world enjoy puppets and each country's puppets are different. We're going to use the World Wide Web to visit different countries and find out what the puppets are like in each one. Then you will make a puppet and write a play for that puppet. When we're all done, we'll have a puppet show! Our first trip is to Japan to learn about Bunraku Puppetry. Brief history on Bunraku puppets. These sites contains many pictures of Bunraku dolls and also contains descriptions of them. This is the Bunraku National Theater in Osaka, Japan. Now let's visit Vietnam and find out about Water Puppetry. A source to purchase water puppets. An excellent resource for pictures. 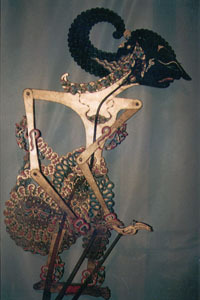 To learn about Shadow Puppetry, let's visit the islands of Java and Bali in Indonesia. Puppetools, The Ancient Art Reinvented and Redefined. This site contains tons of great material for teachers on puppetry. It is unique in that it's focus is puppetry in education and it contains research and writings on the topic. This site contains information for many countries using puppets for social change. Puppetry Home Page is definitely the place to start to learn more about puppetry! CMC - Exhibits - Strings, Springs and Finger Things has lots of simple puppetry definitions, descriptions, and pictures.